Colin Firth starring as Donald Crowhurst: Does it work? I must say that I was waiting for “The Mercy” to be finished and released very eagerly for months since I first read tiny bits and pieces that Colin Firth and Rachel Weisz are going to be starring this film. I was excited and full of joy when we sat down in a small, cosy cinema yesterday and my adrenalin was high when finally the theatre became dark and the movie started to roll. The story of Donald Crowhurst is – in my eyes – one of the greatest stories of yachting. It´s so exciting, so tragic, so colourful, so vivid, so unbelievable that anyone who hears it for the first time does not believe it to be true. My expectations were very high. Now, that I have slept one night over it after I have seen it – sadly – my verdict on the film is not really a good one. Half finished boat. Half finished movie. I do not want to recite the full story line here, there are dozens of reviews out there (and my own article on the Crowhurst-book can be read here anyway). As any of you know, Donald Crowhurst sets out to round the world in a half-finished Trimaran. And half finished is what the movie feels like for me now. Director James Marsh seemed to rush through this drama with a such a high pace (the movie is 1 hour and 52 minutes long) that so many details, deciding details, didn´t even get the chance to be presented to the audience in a proper manner. Colin Firth does his best to portray Donald Crowhurst. In the end, the movie is out as fast as it was setting in. The 13.000 miles and 243 days alone in his fading boat skelter by the audience´s eyes without being able to unfold the full and deep range of motivations, of pretensions, of the inner fight of Donald, his wife Clare, his children and all protagonists. All the rich detail of this great drama seem to be taken out of the box of this great story, held shortly in front of us just to be put back and another one being pulled out. It is sad to see this because the movie – from my personal point of view – does not take advantage of the rich palette of the narratives. Well, the movie is not a bad one, don´t get me wrong here. “The Mercy” gets a lot of things right. First of all the acting of Rachel Weisz is great, although I guess that she has been portrayed kind of weaker as she might have been. The movie can transport the colors, clothing, athmosphere and look of the late Sixties in England very well. I loved the sets and the props. 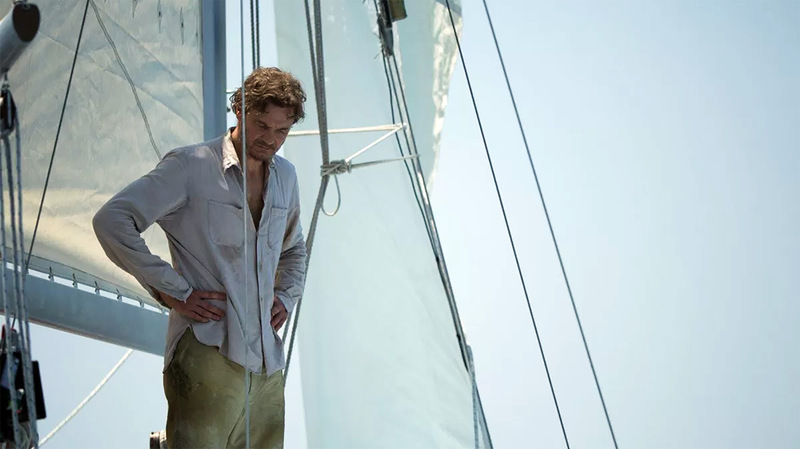 What I particularly loved was the sound design of the film: The noise of the boat, the halyard´s tension making strange squeeks, the waves banging against the plywood hull, the wind in the rigg – all of this was made very well and in a proper proportion of the volume. Concerning the pictures, “The Mercy” is a good film. As I pointed out, the movie is too short in my eyes. The motivation of Donald Crowhurst to get enlisted for the adventure is portrayed with the complete lack of introducing his diverse character. It is reduced to the mere financial defile in which he was at this time. But certainly this wasn´t all that was pushing Crowhurst. Also all the other motivations of Stanley Best, his financier, of his PR-agent, of Clare and others haven´t been developed sufficiently: In this light the movie fails right at the beginning. It´s sad because in the end I think this is the main thing the story is about: Love and pride. And the merciless powers which drive different people to do cruel things. The movie simplifies this and presents these themes in a very sloppy way. The transition of Crowhurst´s mind to becoming mad – which is the second most important theme of the story – hasn´t got the room to unfold in the movie. All the elements which drive Crowhurst losing his mind: The leaking boat, the storm, the sea that is too big for him, the pushing by the people ashore, the constant strain do not get the time to show their power and intensity. For example, when Crowhurst has to stand a storm – a tiny taste of the Roaring Forties – that´s just one single minute in the movie. But the storms of the Forties is what is his main source of fear to die. All in all, it´s like the director had pushed the “fast forward”-button and flies through the story. It´s nothing more than a nice movie for an afternoon – and sadly enough a missed chance to transform this great, haunting and enthralling story into a big movie. Read the book or watch “Deep Water” would be my advice for all who want to get the story in it´s full range.